There has been a lot to do about equity valuations in the last couple of years, especially when it comes to US price-earnings ratios. But at times investors seem to give too much weight to the price component of the PE-ratio, while it is really the earnings component that drives markets. The graph above shows the relationship between the (price) of the S&P 500 Index and the earnings per share realized by S&P 500 companies. As the graph clearly shows, the two tend to move together. But the relative speed varies from time to time. For example, earnings of S&P 500 companies are up 18% over the last 12 months. For the coming 12 months, investors expect an even bigger increase in earnings of 23%. 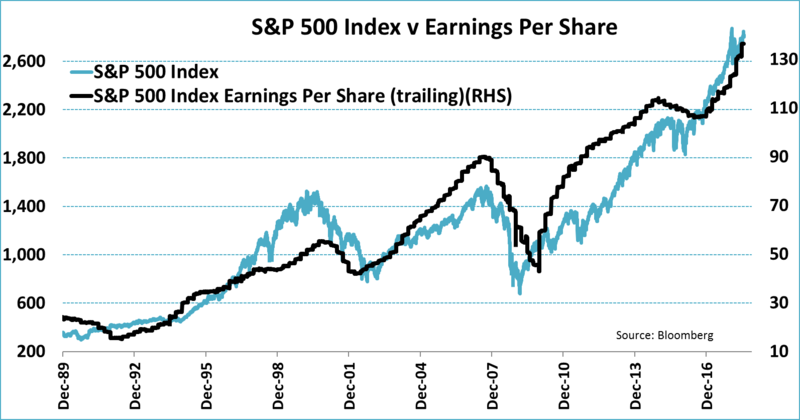 This means earnings are currently outpacing the S&P 500 Index, which is up less than earnings. This is exactly the reason why worries about elevated valuations have dropped considerably. 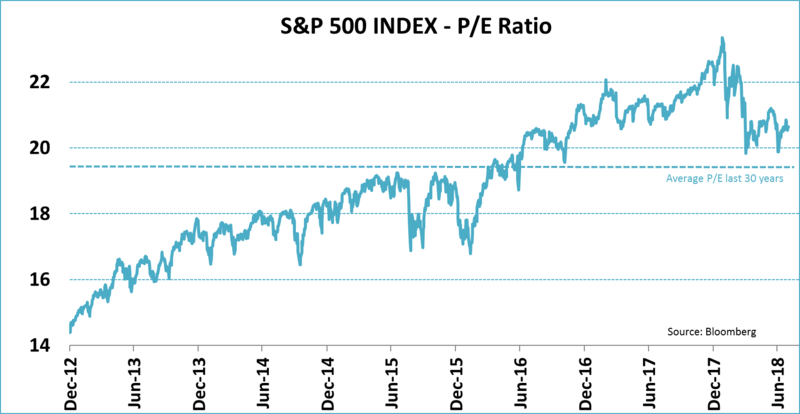 To make this more tangible, the graph below shows the development of the price-earnings ratio for the S&P 500 Index. At the beginning of the year, the price-earnings ratio was at 23.3, but has fallen since then to 20.5, a total drop in valuation of 12%. And this is despite the fact that the index itself has risen by more than 5% this year. These numbers underpin the notion that a significant drop in valuation is caused by fast-growing earnings and not by lower equity prices. In addition, the current price-earnings ratio is ‘just’ 6% higher than the long-term average over the last 30 years. So one could argue that S&P 500 companies have ‘grown into’ their lofty valuations seen at the beginning of the year. The PE-ratio, based on only the realized earnings of the last 12 months, is not the only relevant valuation measure out there. For example, we also look at the so-called CAPE, the cyclically adjusted PE-ratio. This ratio looks at the average earnings of the last 10 years to make sure that temporary effects that have a large impact on earnings (like recessions or tax cuts) do not distort the picture. From this angle the picture looks less upbeat, as is shown below. First, the CAPE for US equities is at 32.4, much higher than the regular PE, and has fallen far less since the beginning of the year. Also the current level of the CAPE lies almost 30% above its 30-year average. Hence, from this angle US equities look more expensive. However, there is one point to take into account: while the CAPE is certainly capable of averaging out temporary earnings effects, it also gets automatically inflated when earnings grow at exceptionally fast rates, like we see now. 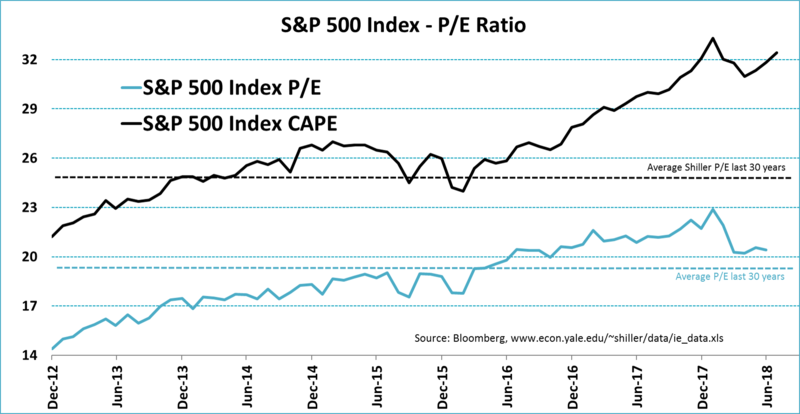 Another bumper year for earnings could well see the CAPE rise and the PE-ratio fall at the same time. This is not necessarily a bad omen for stock prices. ← The World Cup Effect!